William Morrow Paperbacks, 9780062015839, 368pp. 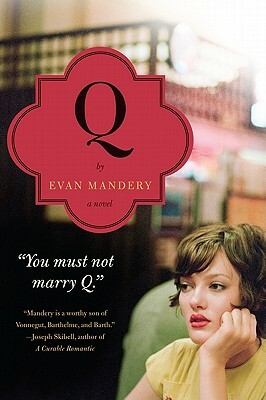 Evan Mandery is a graduate of Harvard Law School, a professor at John Jay College of Criminal Justice in New York City, and the author of Dreaming of Gwen Stefani, First Contact, Q: A Novel, and two works of non-fiction. Q raises some important moral questions. Was it ethical for the older version of the main character, I-55, to encourage the main character to change the path of his life? What about the other older versions? Relatedly, and perhaps most importantly, was it ethical for the main character to decide to abandon Q? Did Q have a right to know the basis for his decision? Are the main character and the future versions of himself the same people? If not, what implications does this have for how we think of ourselves? Is a ten-year old version of myself the same person as me? A thirty-year older version? Fifty? In Q, the price of time travel is extremely high. Does it matter whether a new technology is egalitarian, meaning that it is accessible to all people? Would time travel, on the terms discussed in Q, be an improvement to society? The debate between Herbert Spencer and Sigmund Freud in Chapter 18 is central to the theme of the book. All of the future versions of the main character believe they are making the main character’s life better. Is this belief in progress real or is faux-Freud correct in saying that it is something humans have created to make their lives palatable? Is Q’s father a believable character? Is it possible that he is a different person with Q than in his business dealings? The author writes the entire book in present tense. What do you think of this as a literary technique? What, if anything, is the author’s message in making this choice? Q is a comedy with a supremely tragic premise. Are these choices compatible or incompatible? If you could visit yourself at an earlier point, where would you go and what, if anything, would you say? If you could visit another place and time, where and when would you go?